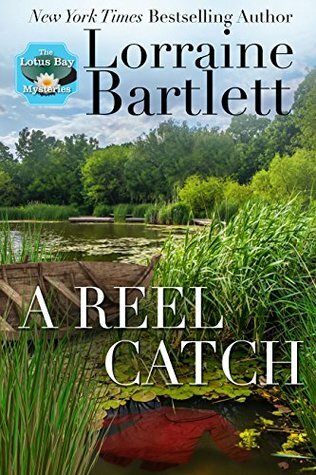 A Reel Catch by Lorraine Bartlett, is the second installment of the Lotus Bay Mystery Series. Tori is helping Kathy clear some brush on her property to get it ready for the opening of Swan's Nest, Kathy's new bed and breakfast. Tori sees a coat in the water. When she tries to pull it out, she discovers it 's not just an empty coat. Tori and Kathy want to find the answers to who the dead man is, his past and who may have wanted him dead. This is the first book I've read in this series, and I thoroughly enjoyed it. Tori and Kathy, along with the whole cast of characters, really drew into the story. They are funny, so likable and very relatable. I found myself wanting to know more about them. The mystery of this book pulled me in right from the first page. I wanted to know who the victim was, what happened and why. I could not put this book down. It held me hostage until I found out how all the pieces of this puzzle fit together. I would recommend this book to any reader who like fun, relatable characters with a mystery that will hold you and keep you guessing until the very end. I received an ARC copy of this book for review from the author. This is an honest review. I will definitely be checking out the first book of this series. I can't wait to find out the backstory of the characters and what the first mystery holds. Lorraine's books have always been some of my favorite reads. Check them out if you haven't already.